This is a tutorial about controlling a Servo with PSoC by generating PWM, adjusting Frequency and Duty Cycle! But how to do that with PSoC 4 ? The answer is TCPWM component, but wait ! How do I make a 50 Hz signal (20 mS) and vary the Duty cycle between 5% (1mS) to 10 % (2mS) ? 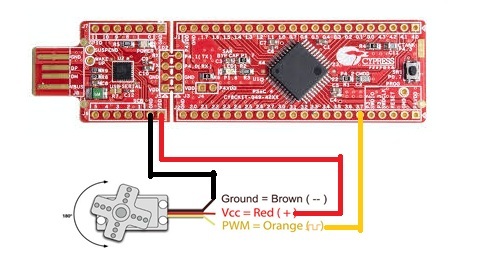 By Changing the Value of Period from "1 to 65535", we can vary PWM Frequency. By Changing the Value of Compare from "1 to Period Value", we can vary Duty Cycle. By Changing the Value of fclk ( Clock signal to PWM component ), we can vary the Frequency range, the larger the fclk, the higher frequency we can generate . Varying the Compare value between 4320 to 4560, we can control the servo because it will generate the desired signal required to do the job ! PWM0_WriteCompare(value) API ( or Function) is used to change the Duty Cycle from C code, which controls the position of the servo ! Important : PWM Pin must be Checked as Hardware Connection ! Otherwise , there will be no output ! Sorry for the crappy quality video. Don't have a better camera right now! PSoC 4 : 4245 AXI/ ARM M0/ Cy8C049 Kit !